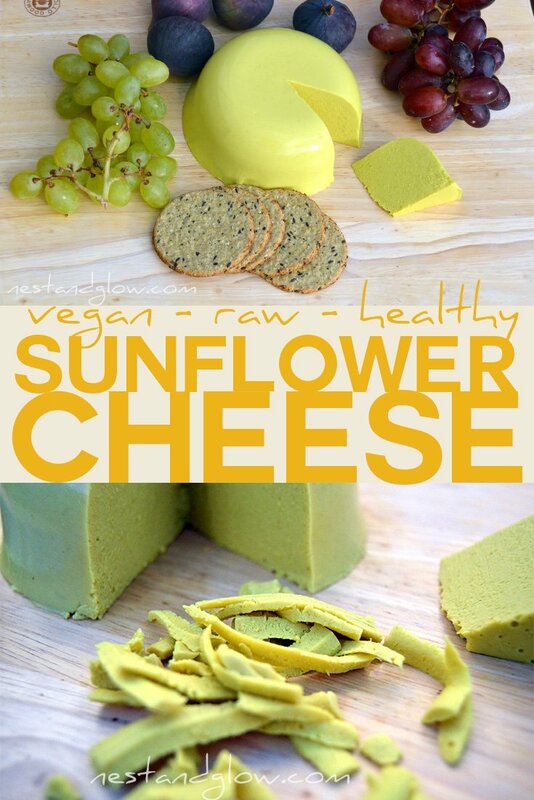 Easy recipe for a raw vegan cheese made from sunflower seeds. Sunflower cheese slices, grates and melts so you can use it in place of regular cheese in most recipes. Heart-healthy cheese that tastes great, is cheap to make and doesn’t take long – what isn’t there to love about this recipe? This seed cheese is one of my staples that I often have a batch of in the fridge. I use fresh garlic and onion as these are widely available and have the most nutrients. You can replace with garlic and onion powder if you prefer, about tsp of each gives the same flavour. Turmeric gives the sunflower cheddar a bright yellow colour and adds valuable nutrients. You really don’t taste the turmeric in this recipe so do add it even if you don’t like the taste. As it’s mainly sunflower seeds in this vegan cheese it is grey without at least a pinch of turmeric. The natural and heart-healthy fats in the sunflower seeds are great for giving optimum absorbtion of the turmeric goodness. This is a quick and easy vegan cheese recipe as it isn’t fermented so it can be made in a few minutes and sets quickly. In the sunflower cheese recipe I usually double the amount of cayenne pepper as I like a bit of a kick. Also you may want to add half a tsp of salt into the recipe, I tend to just have the saltiness from the miso but some might find it a bit bland without it. The miso is just to give the salty and umami flavour to this vegan seed cheese. Miso paste is added after cooking so that none of the nutrients are distroyed. If you can use fresh unpasturised live miso as it’s the most nutritious. It works great without miso if you don’t have any – just add some salt in it’s place. 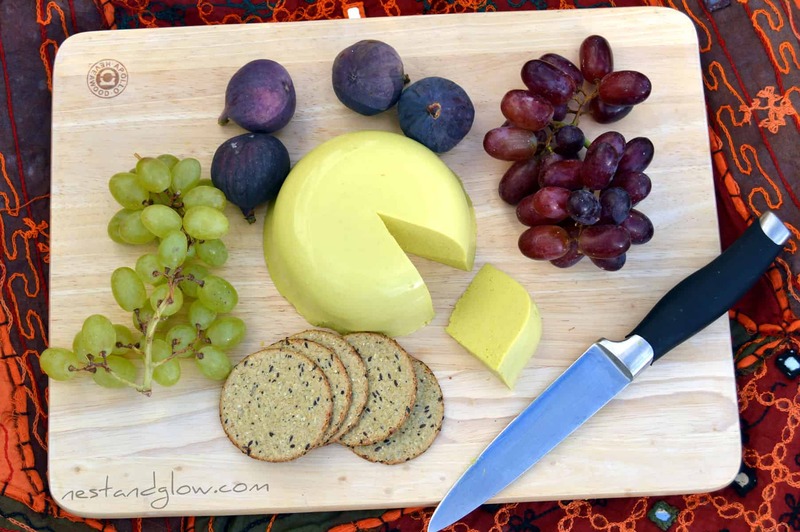 Sunflower vegan cheese is great on a cheeseboard along with smoked cashew cheese and pistachio cheese. If you are allergic to nuts or on a budget this seed cheese recipe is perfect! This vegan cheese can be frozen if you like. I recommend to freeze in wedges and enjoy within 3 months. Just defrost at room temperature for a few hours or overnight in the fridge. I often call this a vegan sunflower cheddar as it has a mild cheesy taste similar to the popular cheddar. Some may not like calling this vegan Cheddar but I actually live next to Cheddar in Somerset so this vegan cheese is way more cheddar than most cheddar cheese! This vegan “cheese” uses sunflower seeds as the base. This means that it is significantly cheaper than using nuts such as macadamia or cashew. It’s actually raw as most sunflower seeds will sprout whereas most nuts will not. The agar agar is cooked in this recipe, but this is just the thickening agent and nutritionally void. The rest is raw and all the nutrients of the seeds and other ingredients are intact so I would still consider this a raw dish, but some purists raw foodists may disagree. This is a sprouted sunflower seed cheese as the seeds are soaked in water to start to germinate and activate. It makes it much easier for the body to digest all of the goodness. Soak the sunflower seeds in water for at least 10 mins, overnight is best if you have the time. In a pan mix together the agar agar with some water until dissolved. Then mix in 1 cup / 240 ml of water. Bring the agar agar mixture to a boil and simmer for 5 mins stirring constantly to prevent any sticking at the bottom. Take the pan off the heat and allow to cool for a few mins and continue with the recipe. Drain and rinse the sunflower seeds. Place everything in a blender, apart from the agar agar mixture, with half a cup / 120 ml of water and blend until smooth. Whisk together the sunflower seed cheese mixture and the agar agar until it’s all combined. Pour into a dish, about 6″ in diameter, and then place in the fridge for an hour to set. You may want to oil your dish, but I tend to use a shiny ceramic dish and the seed cheese comes out easy enough without any oil. 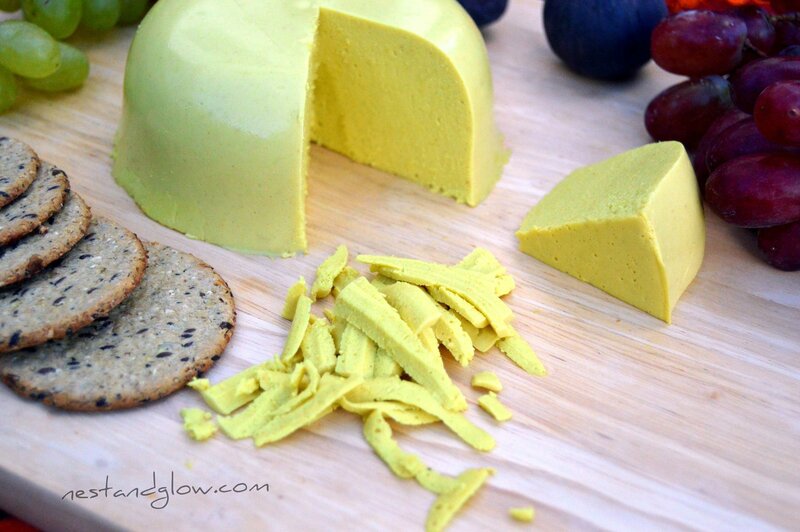 Take the sunflower cheese out of the dish once set and enjoy this vegan cheese in place of normal cheese. It will last a few days in the fridge. If you like this recipe check out my courgetti with a sunflower seed cheese sauce. Looking for some crackers to go with a vegan cheese wheel? Check out my oil free five seed oatcakes recipe. Gluten free and full of goodness. Try a Chinese supermarket that’s where I sourced it plus some other unusual ingredients. Is there anything I can substitute the miso for? It’s hard to find where I live. Since this only lasts a few days in the fridge, could you freeze some of it? I haven’t tried, but I don’t think it would work – the freezing would probably ruin the texture. I’ve never had any of this vegan cheese go bad, it rarely lasts a day and I live on my own 🙂 It’s quite an easy recipe so maybe just make a smaller batch? Sounds like a lovely recipe! Could you use kuzu instead of agar agar though?? What am I doing wrong. The first time I made it perfect, the second and third the agar agar is chunky in the mix. Cooking to long? So frustrating because Agar isn’t cheap. Thanks in advance. Do you think it will have an effect on the finished cheese? hello, could you tell us what are the biscuits or the bread you have with this cheese? it looks yummy and healthy. thanks. Is there a substitute for yeast as I am allergic. I do see this a lot in vegan recipes for cheese. Can have real cheese either as I am allergic to mold too. LOVE this cheese – just wondering if you can freeze it? Hi Susan, sorry that won’t work as the aquafaba won’t set it. What some people do without agar agar is to use corn or tapocia starch and cook it all for 5 mins then bake in an oven to help it set. It doesn’t quite work out the same but its a way to get a reasonable set cheese without agar agar. Wow! This looks so good. I am going to have a go! Thanks for the recipe. Wanting to try your cheese, but unfamiliar with miso. Is miso and paste? I’m finding it in paste form. I have just made your smoked cashew cheese recipes it was lovely but I will put less cayenne pepper next time. My husband dorset normally like this like this but he sure liked this one. My girlfriend loved it to and was going home to make. Should the agar agar be really thick before you added the other ingredients. I am making the pistachio cheese tomorrow and would like to make the. Oat cakes recipe as well thank you so much for the tasty cheeses.I am trying to get off dairy although I don’t use very much. Hi Margaret, Thanks for letting me know that’s always so lovely to hear when someone likes a recipe. Sorry if the cayenne was a bit too much – I probably add it to everything savoury so I’ve got a high threshold. The agar agar mixture shouldn’t be very thick, it’s still quite watery even after simmering to activate. Just make sure none sticks to the bottom of the pan as that’s where people can go wrong. That’s great to hear – nest and glow isn’t about telling people to never have dairy its just trying to encourage people to have more plants through recipes. Vegans and non vegans are very much welcome here. If everyone did have less it would add up to a big change. Hope you like the other recipes, have a great day! I’m excited to try this recipe as my son can’t have dairy or nuts. Have you tried using anchovies as the salty flavoring to add flavor for those who aren’t vegan? Do I use raw sunflower kernels or do dry roasted kernels work well?